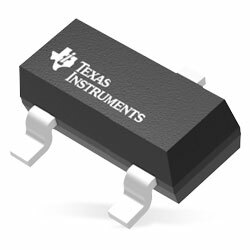 Texas Instruments DRV5057 linear Hall effect sensors respond proportionally to magnetic flux density. The device can be employed for accurate position sensing in a broad range of applications. The device works from 3.3V or 5V power supplies. When no magnetic field is present, the output produces a clock with a 50% duty cycle. The output duty cycle changes linearly with the applied magnetic flux density and four sensitivity options maximise the output dynamic range based on the required sensing range. North and south magnetic poles produce unique outputs. The typical PWM carrier frequency is 2kHz. Magnetic flux perpendicular to the top of the package is sensed, and the two package choices offer different sensing directions. Because the PWM signal is based on edge-to-edge timing, signal integrity is preserved in the presence of voltage noise or ground potential mismatch. This signal is ideal for distance transmission in noisy environments, and the always-present clock enables the system controller to affirm there are good interconnects. The device also highlights magnet temperature compensation to counteract how magnets drift for linear performance across a wide –40C to +125C temperature range. Typical applications include precise position sensing; industrial automation and robotics; home appliances; gamepads, pedals, keyboards, triggers; height levelling, tilt and weight measurement; fluid flow rate measurement; medical devices; absolute angle encoding; and current sensing.